NorwalkPlus.com News - Norwalk, we have a liftoff! It’s pretty safe to say that almost every kid has at one point or another dreamt of becoming an astronaut. For a handful of Norwalk students, going to space is a bit more than a dream. Every year since 1996, the fifth graders of the Young Astronaut program at the Columbus Magnet School in Norwalk participate in a 24-hour simulated mission to space that is as real as it gets. It all started in 1984 with the vision of one of the ex-principals of the school, Mr. Arthur Perschino. He established the program after joining the Young Astronaut Council, a nonprofit international organization whose goal is to promote interest in math and sciences among kids. The very first year, only four students signed up, but the program blossomed with more than 160 students only three years later. 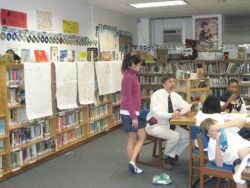 Then, after reading an article in the paper about a local school in Connecticut that did a simulated mission in a cardboard shuttle, Mr. Perschino was inspired to introduce the annual 24-hour event — the first mission, held in 1996 and called Cooperation 7, involved a trip to the moon with a shuttle crew of seven and three mission controllers. Today, the program is as strong as ever, to a large part because of the enthusiasm and dedication of Mr. Andrew Pearce, a teacher at the school and an avid aerospace aficionado, whose classroom rivals many flight museums. As a parent of a student in the program, Mr. Pearce was originally a parent-volunteer, but his immense interest and knowledge in the subject of space and science paired with his ability to work with the students helped him become not only a teacher but also the leader of the program. It’s hard enough to imagine an adult holding an interest in an activity for five years, let alone first through fifth graders; hence, it is easy to expect a large dropout rate throughout the program. Yet, according to Mr. Pearce, whom all young astronauts know and salute as C-in-C (chief-in-command), this year’s graduating class had only three students withdraw during the five years of study. All the others have been with the Young Astronaut program since first grade, as required. Parents of students in the program seem equally excited about the program. “The Young Astronaut program is an experience that’s hard to beat. Opportunities for experimentation abound. 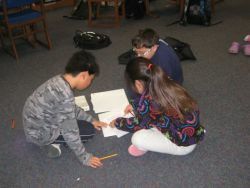 Kids learn about discipline, respect, pride, independence and team-building — life lessons that prepare them for the big world,” says Irene Dixon, mother of 10-year-old student James Hobayan, one of the fifth-grade astronauts preparing for this year’s mission. “We train like actual astronauts because we are astronauts,” exclaims James, evidently enjoying his preparation for the mission. “We are so excited that our daughter is involved in the Young Astronaut program at Columbus. It is amazing that she and all the kids have stuck with the program for all these years. Through their participation in this program, they have learned not only so much about America’s space program, [but they have [also] learned a lot about themselves. Now their hard work and dedication is about to pay off,” says Jeff Spahr, the father of Emma Spahr, another fifth grader who is preparing for the mission in May. “I like being in the Young Astronaut program because I can feel what it’s like to be a real astronaut,” Emma says as she echoes her father’s sentiments. Each annual mission has its own patch, designed by the students themselves, with only minimal help from a professional graphic designer. At the time of the writing of this article in February, the design for the 2009 mission patch was still under development, but past year designs were as professional as those of any real space mission. Every mission is built on real and actual challenges. The 2008 mission was called Objective: Solar Hope, and its goal was to simulate the launch of an array of orbital solar panels that would generate electricity directly from the Sun’s rays, around the clock, and beam it to Earth — a solution that was recently proposed and whose feasibility is currently being explored by leading scientists around the world. This year’s mission objective is to go back to the moon, to carve the path for launching a moon base that would ultimately be the staging area for human exploration of the solar system — one of the new real-world objectives for NASA. “Going to the moon was, simply, the greatest adventure in human history. As a species, humans have always felt the need to expand their horizons, whether it was crossing the Atlantic Ocean in fragile wooden boats, delving into the intricacies of human DNA or rocketing into the vacuum of space. 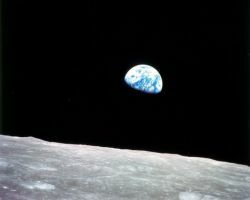 Apollo 11 united the country and world in a sense of wonder that has never been equaled. The students of the Columbus Magnet School Young Astronaut program understand the magnitude of that achievement, and they choose to honor it. The mission name says it all, Luna Redux,” says Mr. Pearce, excited about the revived national interest in the space program. Luna Redux is Latin for “the moon again” and signifies the future return of humankind to the moon surface. Mr. Pearce’s fascination with science inevitably led to his admiration of Latin, which many scientists still consider the language of science. Mr. Pearce’s attention to detail in every aspect of the mission ensures that the simulation comes as close to the pressures, responsibility and teamwork requirements of a real mission as possible. Even the selection process for the positions of the space team and mission control is as real as it gets. Students are asked to write a short bio and are later interviewed (each interview may last an hour or more); during the interview, students are asked about their goals, aspirations, preparedness and other questions that are relevant to the job. Not surprisingly, many want to be the mission commander, and few want to be the public relations officer on the ground at mission control, but what could be a problem for some, C-in-C turns into an opportunity to further promote teamwork. He explains to all students that while the commander is probably the most visible member of the mission, none of the astronauts in space would be there in the first place were it not for the hard work and dedication of every single team member on the ground. 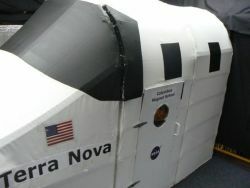 On the day of the simulated mission, the culmination of five years of dedication and effort, the astronauts are paraded through the hallways of the school, each dressed in astronaut jumpsuits, complete with patches and helmets, and led to the “capsule” — a 10-foot-square room, equipped with a couple of desks, mission documents, cameras (so that mission control can see the crew) and the all-important sanitary facilities (a port-a-toilet in the closet space of the room). The room is locked, and the astronauts are ready for blast off. Mission control, sitting in another room and communicating with the astronauts via walkie-talkies, then takes over, and soon the crew is on its way to space. During the 24-hour round-the-clock mission, anything can happen, and both the crew and mission control are prepared to take on the challenges of flying into the unknown. Mr. Perschino is proud of the accomplishments of the Young Astronaut program. “The program was started to use the excitement of the space program to improve students’ performance in math and science, and as a result, I saw a significant increase in their grades,” says the ex-principal. For Mr. Pearce, the program is a reflection of an important moment of our nation’s history.